For the first time in over 50 years, the Barber Shop that is as much a part of township of Kearns as the name itself is closed. Closed forever. My dad died yesterday. I love him so much. Goodbye. These put Christmas lights on my house. The lights quit working three weeks after they were put up. They tried to charge me for more hours than they actually spent putting the lights up. Utah is a state in the western United States. It became the 45th state admitted to the Unionon January 4, 1896. Utah is the 13th-largest, the 33rd-most populous, and the 10th-least-densely populated of the 50 United States. Utah has a population of about 2.9 million, approximately 80% of whom live along the Wasatch Front, centering on Salt Lake City. Utah is bordered by Colorado to the east, Wyoming to the northeast, Idaho to the north, Arizona to the south, and Nevada to the west. It also touches a cornerof New Mexico in the southeast. The state is a center of transportation, education, information technology and research, government services, mining, and a major tourist destination for outdoor recreation. In 2013, the U.S. Census Bureau estimated that Utah had the second fastest-growing population of any state. St. George was the fastest–growing metropolitan area in the United States from 2000 to 2005. A 2012 Gallup national survey found Utah overall to be the "best state to live in" based on 13 forward-looking measurements including various economic, lifestyle, and health-related outlook metrics. The name "Utah" is derived from the name of the Ute tribe. It means "people of the mountains" in the Ute language. Utah is known for its natural diversity and is home to features ranging from arid deserts with sand dunes to thriving pine forests in mountain valleys. It is a rugged and geographically diverse state that is located at the convergence of three distinct geological regions: the Rocky Mountains, theGreat Basin, and the Colorado Plateau. Utah is one of the Four Corners states, and is bordered by Idaho in the north, Wyoming in the north and east; by Colorado in the east; at a single point by New Mexico to the southeast; by Arizona in the south; and by Nevada in the west. It covers an area of 84,899 sq mi (219,890 km2). The state is one of only three U.S. states (with Colorado and Wyoming) that have only lines of latitude and longitude for boundaries. One of Utah's defining characteristics is the variety of its terrain. Running down the middle of the northern third of the state is the Wasatch Range, which rises to heights of almost 12,000 ft (3,700 m) above sea level. Utah is home to world-renowned ski resorts, made popular by the light, fluffy snow, and winter storms which regularly dump 1 to 3 feet of overnight snow accumulation. In the northeastern section of the state, running east to west, are the Uinta Mountains, which rise to heights of over 13,000 feet (4,000 m). The highest point in the state, Kings Peak, at 13,528 feet (4,123 m), lies within the Uinta Mountains. At the western base of the Wasatch Range is the Wasatch Front, a series of valleys and basins that are home to the most populous parts of the state. It stretches approximately from Brigham City at the north end to Nephi at the south end. Approximately 75 percent of the population of the state live in this corridor, and population growth is rapid. Western Utah is mostly arid desert with a basin and range topography. Small mountain ranges and rugged terrain punctuate the landscape. TheBonneville Salt Flats are an exception, being comparatively flat as a result of once forming the bed of ancient Lake Bonneville. Great Salt Lake,Utah Lake, Sevier Lake, and Rush Lake are all remnants of this ancient freshwater lake, which once covered most of the eastern Great Basin. West of the Great Salt Lake, stretching to the Nevada border, lies the arid Great Salt Lake Desert. One exception to this aridity is Snake Valley, which is (relatively) lush due to large springs and wetlands fed from groundwater derived from snow melt in the Snake Range, Deep Creek Range, and other tall mountains to the west of Snake Valley. Great Basin National Park is just over the Nevada state line in the southern Snake Range. One of western Utah's most impressive, but least visited attractions is Notch Peak, the tallest limestone cliff in North America, located west ofDelta. Much of the scenic southern and southeastern landscape (specifically the Colorado Plateau region) is sandstone, specifically Kayenta sandstoneand Navajo sandstone. The Colorado River and its tributaries wind their way through the sandstone, creating some of the world's most striking and wild terrain (the area around the confluence of the Colorado and Green Rivers was the last to be mapped in the lower 48 United States). Wind and rain have also sculpted the soft sandstone over millions of years. Canyons, gullies, arches, pinnacles, buttes, bluffs, and mesas are the common sight throughout south-central and southeast Utah. This terrain is the central feature of protected state and federal parks such as Arches, Bryce Canyon, Canyonlands, Capitol Reef, and Zion national parks, Cedar Breaks, Grand Staircase-Escalante, Hovenweep, and Natural Bridges national monuments, Glen Canyon National Recreation Area(site of the popular tourist destination, Lake Powell), Dead Horse Point and Goblin Valley state parks, and Monument Valley. The Navajo Nationalso extends into southeastern Utah. Southeastern Utah is also punctuated by the remotek, but lofty La Sal, Abajo, and Henry mountain ranges. Eastern (northern quarter) Utah is a high-elevation area covered mostly by plateaus and basins, particularly the Tavaputs Plateau and San Rafael Swell, which remain mostly inaccessible, and the Uinta Basin, where the majority of eastern Utah's population lives. Economies are dominated by mining, oil shale, oil, and natural gas-drilling, ranching, and recreation. Much of eastern Utah is part of the Uintah and Ouray Indian Reservation. The most popular destination within northeastern Utah is Dinosaur National Monument near Vernal. Southwestern Utah is the lowest and hottest spot in Utah. It is known as Utah's Dixie because early settlers were able to grow some cotton there.Beaverdam Wash in far southwestern Utah is the lowest point in the state, at 2,000 feet (610 m). The northernmost portion of the Mojave Desert is also located in this area. Dixie is quickly becoming a popular recreational and retirement destination, and the population is growing rapidly. Although the Wasatch Mountains end at Mount Nebo near Nephi, a complex series of mountain ranges extends south from the southern end of the range down the spine of Utah. Just north of Dixie and east of Cedar City is the state's highest ski resort, Brian Head. Like most of the western and southwestern states, the federal government owns much of the land in Utah. Over 70 percent of the land is either BLM land, Utah State Trustland, or U.S. National Forest, U.S. National Park, U.S. National Monument, National Recreation Area or U.S. Wilderness Area. Utah is the only state where every county contains some national forest. 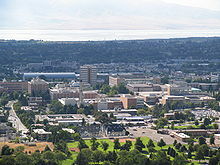 Utah's population is concentrated in two areas, the Wasatch Front in the north-central part of the state, with a population of over 2 million; andWashington County, in southwestern Utah, locally known as "Dixie", with over 150,000 residents in the metropolitan area. According the 2010 Census, Utah was the second-fastest growing state (at 23.8 percent) in the United States between 2000 and 2010 (behind Nevada). St. George, in the southwest, is the second-fastest growing metropolitan area in the United States, trailing Greeley, Colorado. The three fastest-growing counties from 2000 to 2010 were Wasatch County (54.7%), Washington County (52.9%), and Tooele County (42.9%). However, Utah County added the most people (148,028). Between 2000 and 2010, Saratoga Springs (1,673%), Herriman (1,330%), Eagle Mountain (893%), Cedar Hills (217%), South Willard (168%), Nibley (166%), Syracuse (159%), West Haven (158%), Lehi (149%), Washington(129%), and Stansbury Park (116%) all at least doubled in population. West Jordan (35,376), Lehi (28,379), St. George (23,234), South Jordan(20,981), West Valley City (20,584), and Herriman (20,262) all added at least 20,000 people.